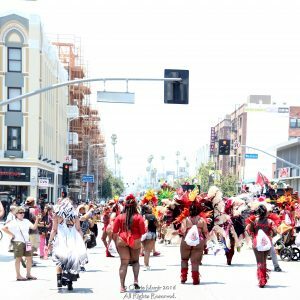 The city of Hollywood, California, had a huge surprise when on a heated yet cooler summer day a double-decked caravan of folk Bollybound known as the Island Revelers took to the streets. While everyone scrambled to get a glimpse of g-stringed girls slanging but from up high and down on the ground the air was filled with gaiety, twerking, and a host of armed security who spotted there every move by walking alongside while holding up yellow tape. With a stilt walker as sidebar lots of local residents of the Hollywood Boulevard area were treated to an afternoon snack of skin and an outrageous array of color. The spectacular group made their way through a diverse crowd of on lookers, making lots of noise with hot Island music tracks bellowing throughout the Hollywood community. Island Revelers aka Hollywood Carnival /Los Angeles Cultural Festival happens once a year in Los Angeles. The Revelers who are a Mas Band along with masqueraders in full costume take turns strutting in front of cameras as they cross-judging points and rival with other bands, it is quite a spectacle. They come with history and a variety of mythological concepts that depict the main theme of the carnival and celebrate both the similarities and differences of culture as they relate to the carnival experience. The competition is divided into three categories of small, medium, and large with winners announced after the bands have crossed the stage upon which the winner is named Champion Band of the Year. The bands and performers walk three miles ending at North Highland into the Carnival Village wherein well-known celebrities, movie stars, and music icons are featured. For more information on the Island Revelers contact 760.669.8200, hit them up on Twitter @islandrevelers, islandrevelers@gmail.com and Islandrevelers.com.